McDonald’s is no ordinary chip shop. It is the biggest employer of part-time labour in the United States, employing over 150,000 young workers. It now has 5,000 outlets around the world, all operating on the principal of simple food, quick service and cheap labour. They don’t like trade unions. McDonald’s boss, Ray Croc, has boasted that the unions could not touch him ‘with a ten foot pole’. It came as no surprise when some of the workers in their two Dublin shops joined the ITGWU [Irish Transport and General Workers' Union] no. 4 branch. Pay was only 85p per hour, a very low rate even for the catering industry. Management refused to recognise the union or even to talk over the phone to the union officials. On March 16th, the union members came out and the pickets went on. The strikers’ demands were simple – union recognition and an end to low pay. The strike got McDonald’s worried. Most of the full-time and a good number of the part-time workers were out on the picket. They raised the hourly rate to £1 in an attempt to keep the remaining workers inside but even so more came out and joined the union. They then resorted to offering free chips to anyone who would scab by crossing the picket to eat there. Morale among the strikers was high. Even the arrest of two ITGWU officials, Tony Mulready and Noel Dowling, on picket duty did not frighten them. However McDonald’s were not just sitting around. On the basis of truth, half-truth and outright lies they went to the High Court and got an injunction banning all picketing. This was soon changed to allow restricted picketing, only three people at any one time and not at all during the last hour of business. Three strikers, Jimmy Mackin, Noel Boyle and Sean Mrozek, were ordered not to picket at all. Morale sank when the union officials restricted the fightback against the injunction to legal arguments in the court. They would not support the injunction breaking mass pickets, even though most of the strikers took part in at least some of them. Noel Boyle and Jimmy Mackin continued to picket, again without any support from Liberty Hall [ITGWU headquarters]. The officials had given up any hope of winning the strike. The co-ordinating committee set up by the union district council had to disband because of lack of help from no. 4 branch officials, John Burke and Tommy White. Indeed these two seemed to spend most of their time trying to dampen down support for the strikers. They did little other than organise some collections – a good and useful exercise but not enough. The co-ordinating committee had at least organised a march which brought out 1,000 workers and their families. They had produced thousands of stickers and had helped out by doing picket duty. But the branch officials would not attend their meetings or give co-operation. McDonald’s could have been closed if their supplies had been stopped. Dockers and airport workers refused to handle the scab food. Then the supplies started to come in through the North. The officials knew that this food was being stored in the Superdine warehouse outside Naas but wouldn’t even put a picket on the place. In short they made no real attempt to stop the scab supplies getting in. The branch officials even went so far as to give a list of ‘approved’ picketers to the Gardai [police] and to the boss. This gave encouragement to the Special Branch in their harassment of picketers by visiting them at their homes. The Gardai obviously felt, and unfortunately they were right, that the union would not stand up for its members. Pickets were ordered to move away from the doors, to walk on the road, not to explain their case to passers-by. This was a strike which had enjoyed widespread support and publicity. 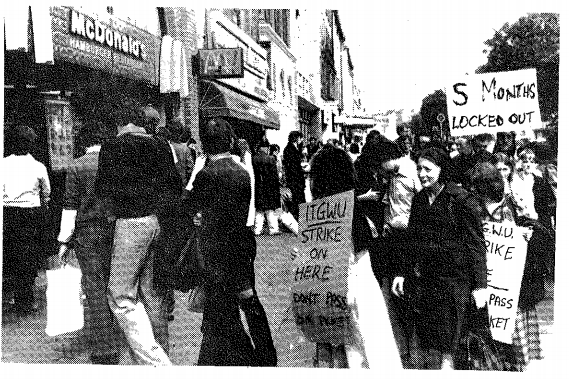 The POWU [Post Office Workers’ Union] members (themselves also on strike at the time) were a great example with their constant support for the picket line. Many members of the ITGWU donated money, joined the picket and raised the issue in their workplaces. Other workers from the FWUI [Federated Workers Union of Ireland], MPGWU [Marine, Port and General Workers' Union], AGEMOU [Automotive, General Engineering and Mechanical Operatives' Union], ATGWU [Amalgamated Transport and General Workers Union], AUEW [Amalgamated Union of Engineering Workers] and a host of other unions helped out, as did many housewives, students and socialist organisations. The strikers should have been the ones running the strike. If this had been so they could have really used this support to ensure a speedy resolution of the dispute. Mass pickets on the scab suppliers, occupations, effective picketing around the clock and various forms of ‘direct action’. But the strikers had little or no experience of trade unionism. It was not until near the end of the strike that they really accepted that they had both the right and the capability to take over the running of their own struggle. The role of the officials should simply have been to provide the experience and the necessary back up services, not to dictate the running of the strike. However while things looked gloomy on the picket line, McDonald’s were not very happy either. Business was down, their ‘one big happy family’ reputation had been badly tarnished and their scab customers still had to pass a picket to get in. They looked around for a way out. Since the beginning of the strike they had said that they would not be bound by any decision of the Labour Court, but now they went to the court and when it recommended union recognition they agreed. The strikers went back to work on Monday 10th, September but immediately it was clear that all was not well. The hourly rate was only £1.05p, though most were now getting the grand sum of £1.15p. Still a very low wage, and to make even this small increase worthless everyone only got 35 hours work instead of the previous 40. One striker, Jimmy Mackin, was refused his job back. Two others, Ann Holmes and Tom Caufield – both of whom had been on the strike committee, had their job status reduced. Men had to get their hair cut really short, a lot shorter than the scabs who had been employed during the strike. General harassment of union members was the order of the day. Instead of welcoming those other trade unionists who joined the picket line, the hacks in Liberty Hall condemned them as ‘outside elements’. General Secretary, Michael Mullen, tried to use his influence to stop the good coverage being given to the strikers’ case in Republican News. To cap it all they then expelled Jimmy Mackin from the union for his decision to continue to picket in defiance of the injunction. It is up to the ordinary members of the ITGWU and especially those in the no. 4 branch to kick up hell and demand that proper service be given to these members. Given enough support these young workers can still turn McDonald’s into a real union shop. What is really needed, however, is a strong rank and file movement inside the ITGWU which will fight for a truly democratic and militant union. A movement of ordinary members who will give what aid they can to other members in disputes and who will make real again the concept of workers’ solidarity. These young workers have done the impossible, they have got a union into McDonald’s. They have given a lead to 150,000 other McDonald’s workers around the world.